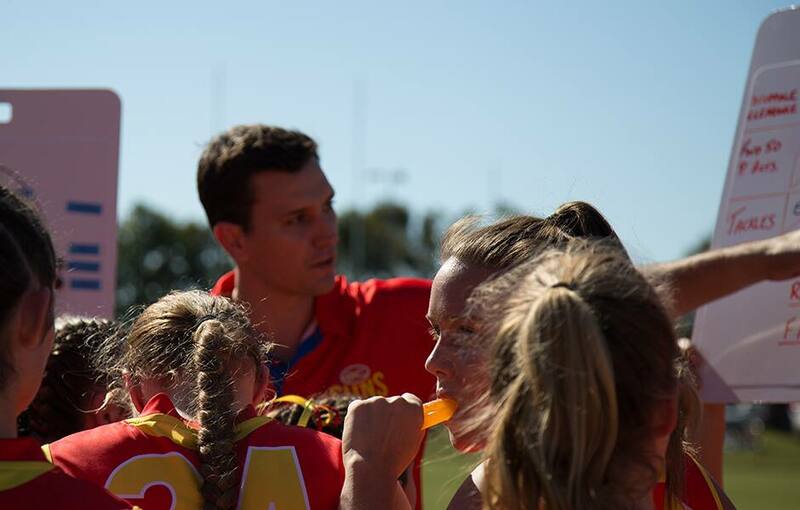 The Gold Coast SUNS U18 Female Academy side begun the season on a winning note, downing the Lions by 71 points at Yeronga on Saturday. The SUNS were impressive all day, holding the Lions goalless while piling on 11 majors of their own. Female Academy Head Coach Michael Gugliotta told SUNS Media he was extremely pleased with the way the girls executed on gameday. “Our process and competitive attitude towards each contest gave us the opportunity to create strong offensive run and defensive pressure across the whole ground,” Gugliotta said. “We played to our structure very well and the coaches will continue to drive this going forward. The SUNS outmuscled the Lions in the middle of the ground, winning the clearance count convincingly and releasing the team’s speedsters to capitalise on the outside. In defence, the Gold Coast girls were able to spoil effectively and intercept whenever possible. Of note was Gold Coast’s ability to set up effectively in defence allowed the side to generate scores from turnovers coming out of the backline. Gugliotta said it was important his team continue were they left off in Round 2 this Saturday against the same opponent. “As we shift our focus to this weekend we need to acknowledge that the Lions team will have strong inclusions,” Gugliotta said. Saturday’s match will be the last opportunity for the girls to cement a place in the Queensland side ahead of the 2019 NAB AFLW Under-18 Championships.